OM-140 Series are in the end of its life cycle. Last time buy discounts up to 30% have been applied to all remaining inventory in the Place Order Table. 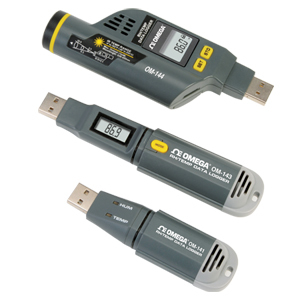 As a possible substitute, please check out Newest Released Temperature and Humidity USB Data Logger OM-HL-SP Series for more advanced features. The OM-140 Series are low-cost, compact, battery powered temperature/humidity data loggers capable of unattended logging (recording) of the ambient temperature and relative humidity (RH) of an environment for days, weeks or months. The OM-144 data logger can also measure and optionally log surface temperatures spot-checked by a technician using the unit’s integral infrared (IR) thermometer. In addition, these units can also calculate and display absolute humidity levels in units of grains per pound (GPP) or g/kg. Also called mixing ratio, GPP is a more useful moisture metric than RH to water damage restorers. Using RH alone, a restorer might unknowingly introduce moist air—with a low RH but a high GPP—during a job’s drying phase. Data logging can be started or stopped by pushing a button on the unit, eliminating the need to bring a laptop to the job site. After a data log has been captured and stored, it can be uploaded as a .txt file to any PC running the Windows® XP/7 or 8 operating system after plugging the data logger into one of the computer’s USB ports. The data logger’s internal flash memory is large enough to store 16,300 pairs of temperature and RH readings or for the model OM-144 nearly 10,000 sets of RH, ambient temperature and surface temperature readings. Included with the product is a mini-disc with the drivers needed to interface the unit to the computer, as well as software that can display a data log file as a table or graph and/or export it to Microsoft Excel. Exporting to Excel is recommended for sophisticated trending and analysis of humidity and temperature data and easy detection of unexpected excursions. Note: Comes complete with Windows software on CD, protective cap, USB extension cable, 3.6V lithium battery and user’s manual. Models OM-141 also include a magnetic mounting base.